One of the awesome things about living in this part of the world is you get to spend Christmas at the beach, and those Santa filled summer days ladies and gentlemen are getting closer and closer. 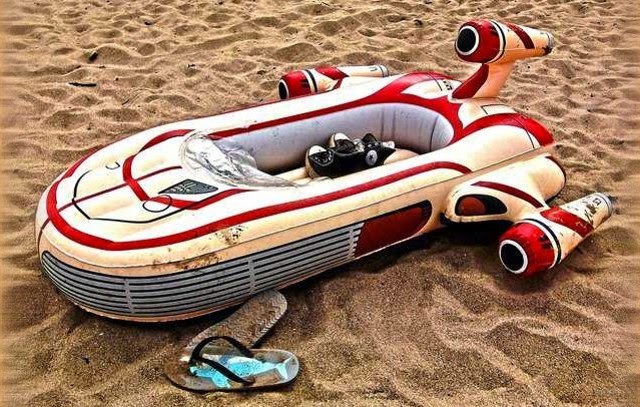 Now if the Government would just buy everyone one of these Star Wars Landspeeder pool floats with which to enjoy the season with, we would be one ultra-happy nation. Sure the price tag is a stinging US$200, but when you factor in increased belief in that fictional dream 'the work life balance' and over 70 inches of straight all round coolness, I'm sure it works out even. I'm even thinking of making mine a sofa/bed/office desk - what do you mean you can't put my calls through? I tell you, interior design lost a genius when I turned to blogging. Okay, there needs to be a bigger size, with cup holders. And jets. For that matter, someone should just build a boat that looks like a landspeeder. With R2D2 life jackets. That last part is awesome Random - especially if the whistle is just like R2's beeps! Item number 20013 in our cool ways to make money file.